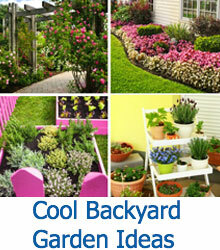 Here is a gallery of Hanging Basket Ideas to help you with your next project. These ideas include recycled planters which will make your next project unique! We can appreciate our gardens because they are ultimately a way for us to interact with nature. Whether we are introducing new man-made features to a landscape, or cultivating land to produce the best plants possible, we are interacting with the land and creating a space that is meant for everyone to enjoy. Unfortunately in this progressive and fast moving world, people are often wasteful, and interacting with nature in a positive way has become less and less of a priority for the general public. But for those of us who still maintain a healthy garden, there are plenty of ways to combat the increasingly apathetic attitude of others. By incorporating recycled material into the design of our gardens, we can reduce waste while simultaneously showing creativity and character. 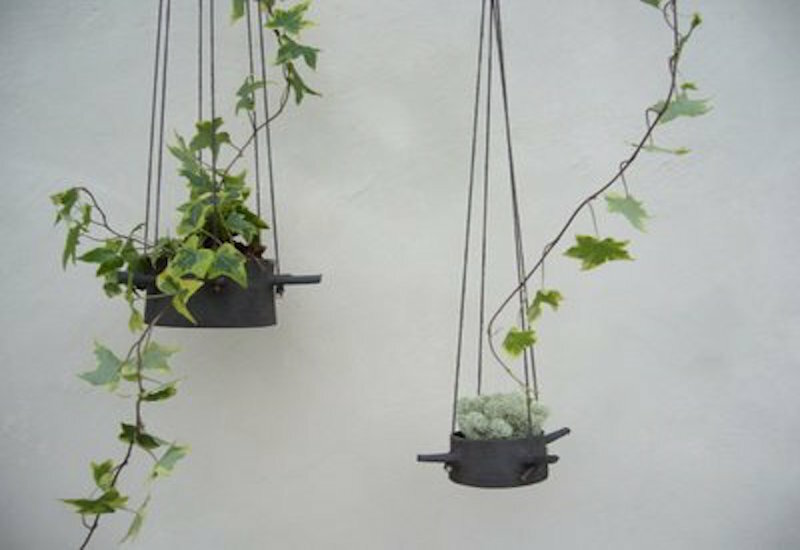 A great way to use simple recycled material is through hanging baskets. Whether used as a planter, a lantern, or a simple basket for miscellaneous items, there are all kinds of reusable objects that can be stylish and functional. 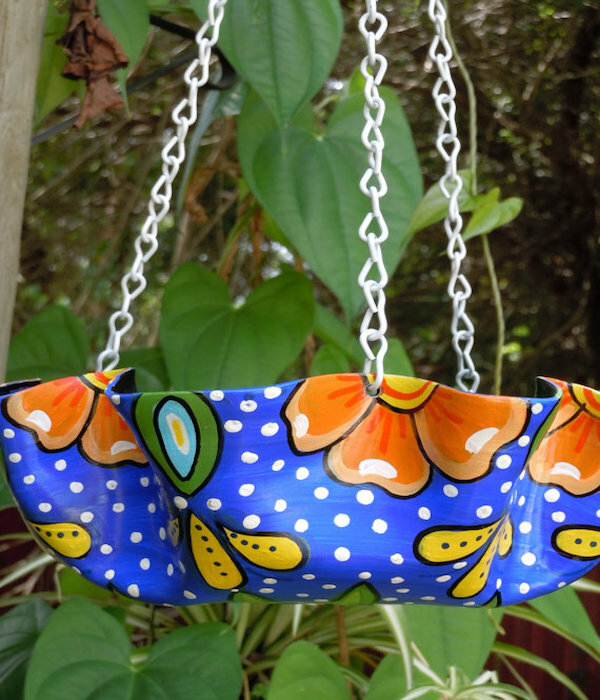 This hanging planter has a simple and easy to make design. 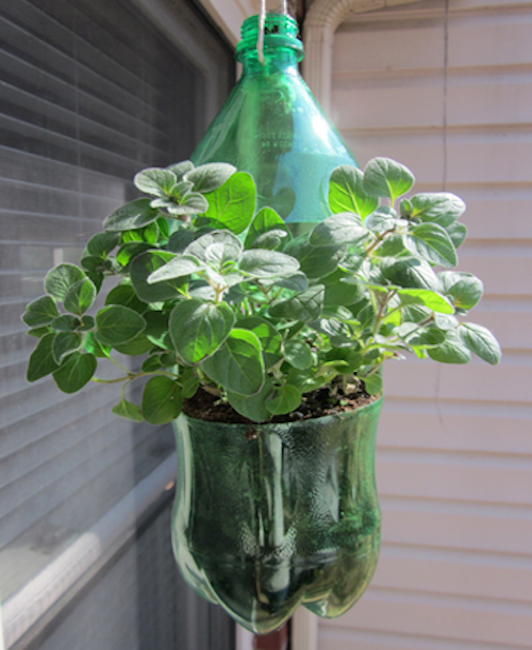 Cut out any section of a plastic soda bottle and fill it with soil to recreate your own soda bottle planter! 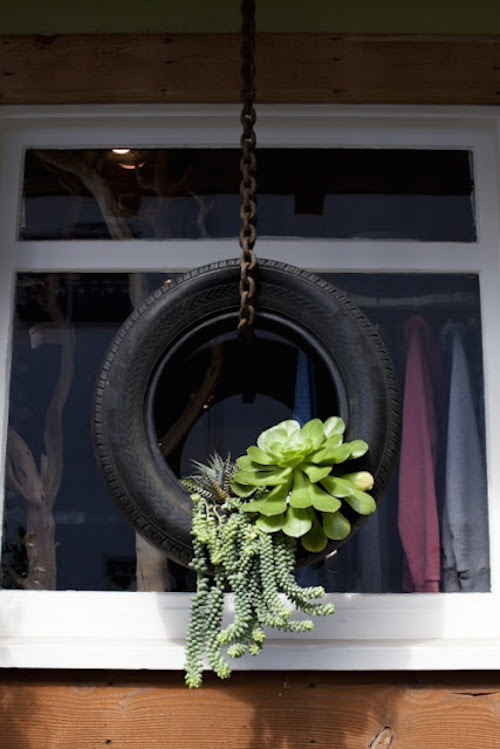 An old popped tire can be a lot more than just an eyesore behind your garage, hang it from a chain around your garden and plant flowers inside, or use a board wedged in the bottom to create a shelf to hold outdoor decorations. This creative and unique hanger uses an old bike chainring to hold a small pottery planter. 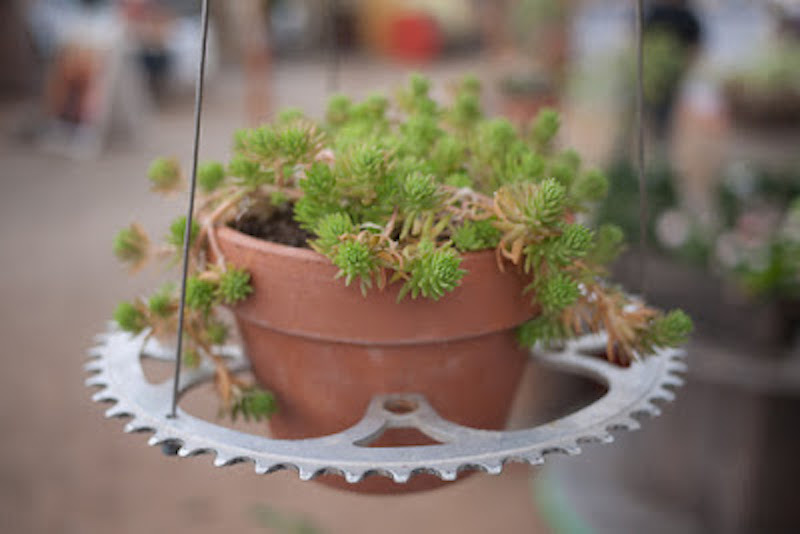 Hang multiple chainrings around your garden area to create a unique theme for your space. An elegant and classy hanging basket, this design utilizes old wine and oil bottles as planters for small Coleus Watermelon plants. 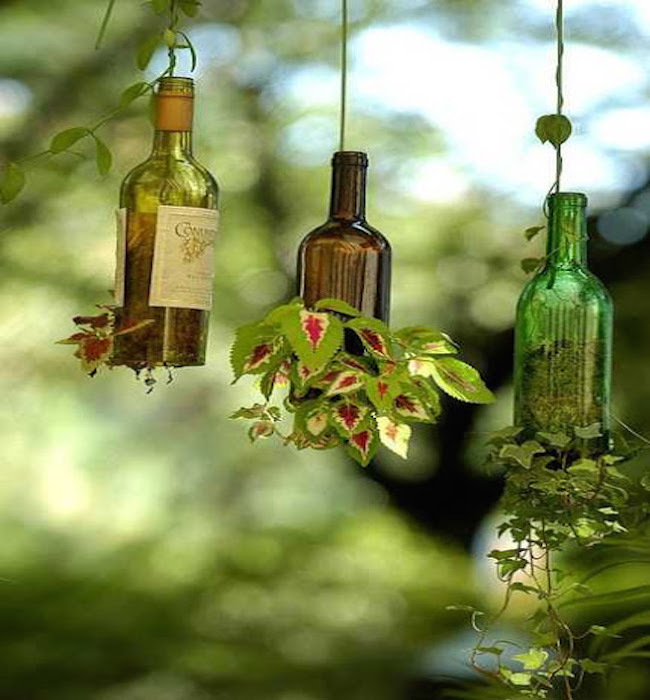 A great alteration would be to fill the bottles with colorful rocks or sand to create a unique outdoor decoration. 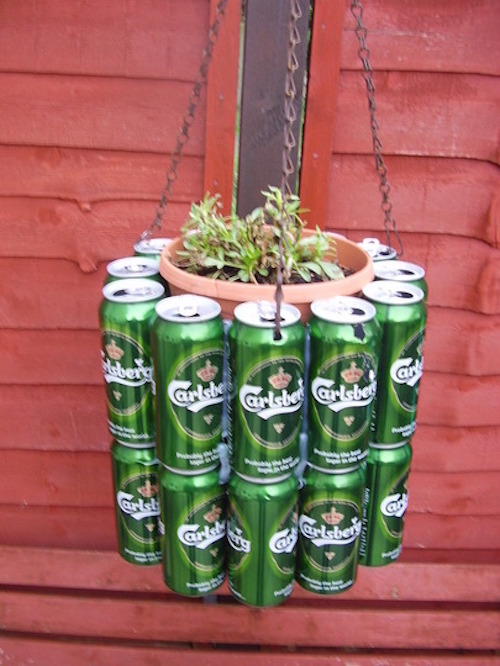 A great way to get all the fellas to appreciate your gardening, this fun design uses several old beer cans glued together to form a basket for a planter or whatever decoration you may choose. 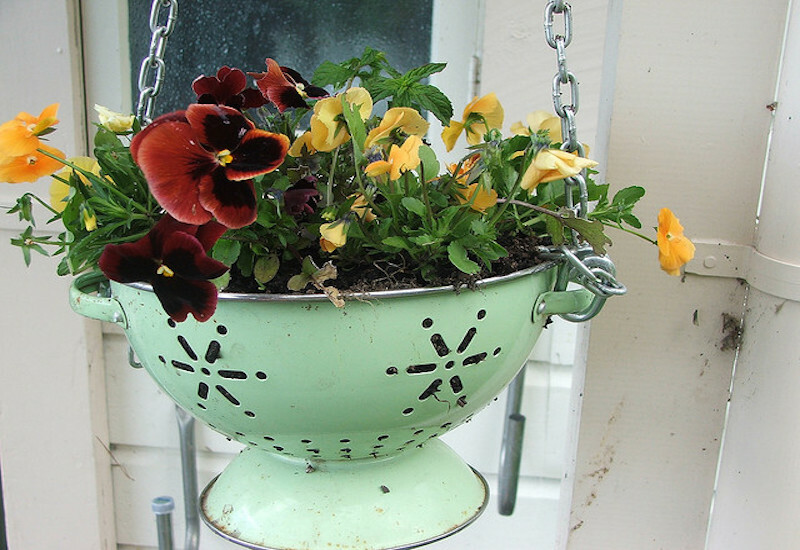 An old fashioned colander is hung here by two chains and filled with soil to serve as a decorative hanging planter. Instead of just tossing out old kitchen utensils like this, there are so many ways to reuse them creatively! 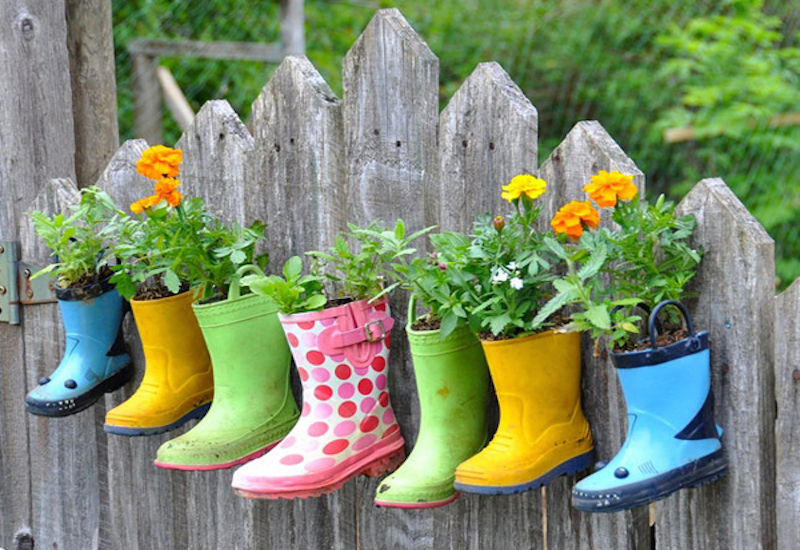 If you just can’t get yourself to throw away the kid’s old rain boots, this is a great way to keep the memory around while also creating functional decor for your backyard! 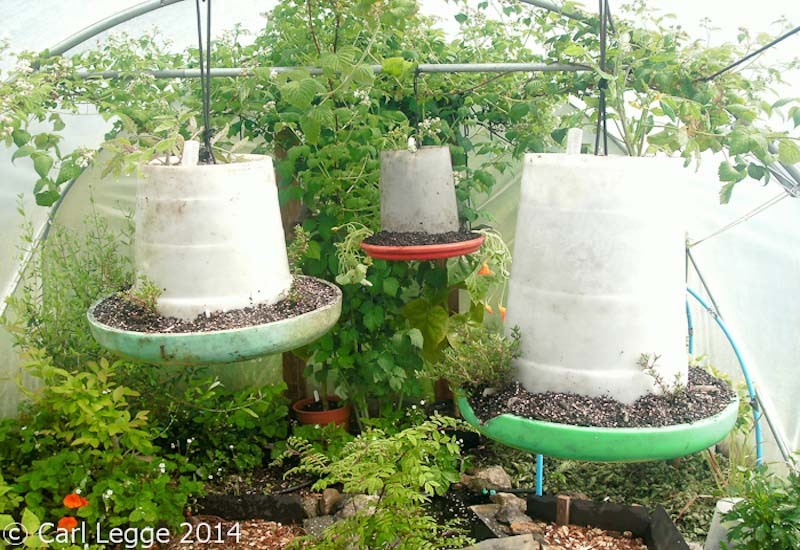 These old chicken feeders surprisingly make great planters for large hanging plants! They may not be the most visually appealing, but they can easily be painted to match any look that you may desire. 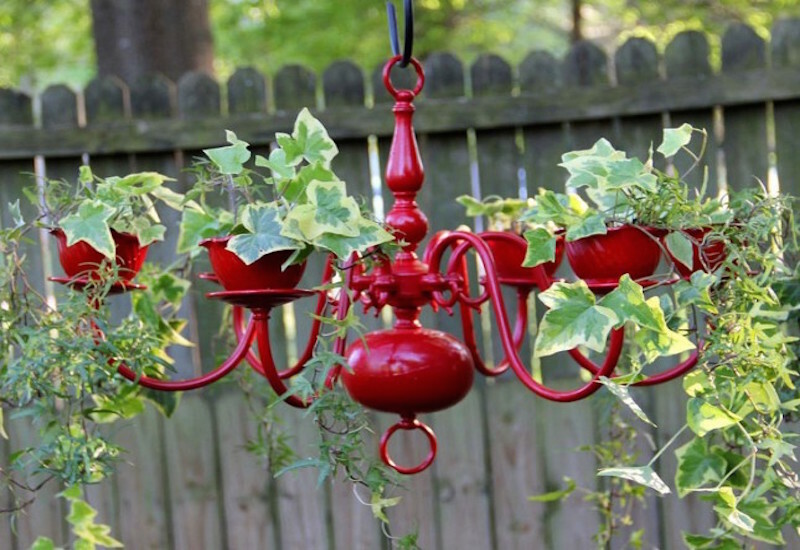 A unique way to use an old chandelier, this design is the perfect way to add that elegant touch to your backyard or garden. As shown above, hanging plants and vines look great with this particular design. 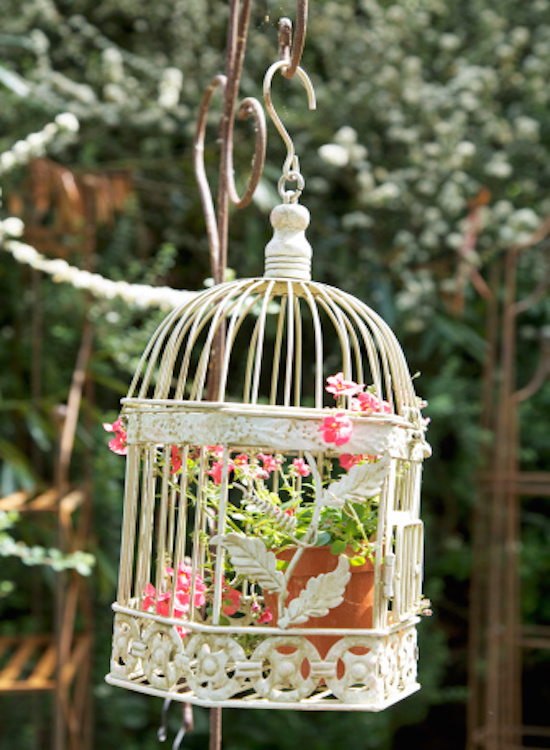 This vintage birdcage will give any space a touch of class, it can be used to hold anything from a small potted plant to suet cakes for feathered friends. 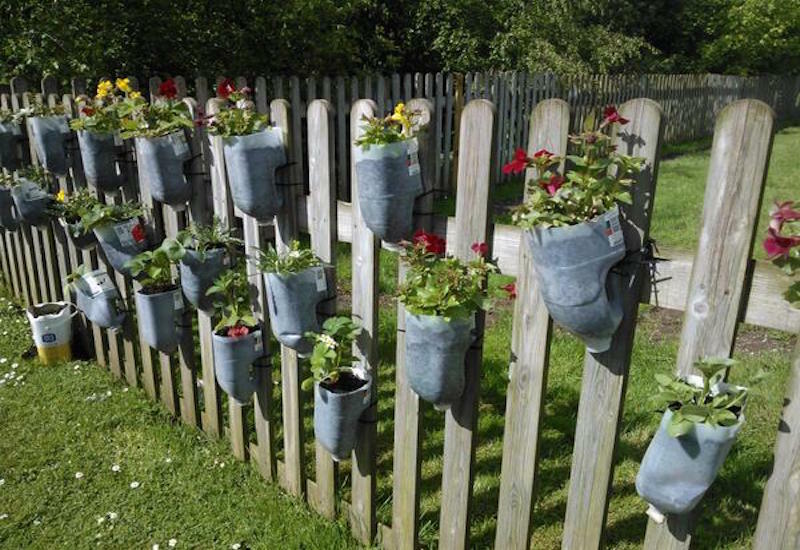 These recycled jug planters are ideal if you want to have several different hanging baskets. This example shows them all as planters, but they can be used to hold any kind of garden decor. You can also paint the outside of the jug to get the perfect look. 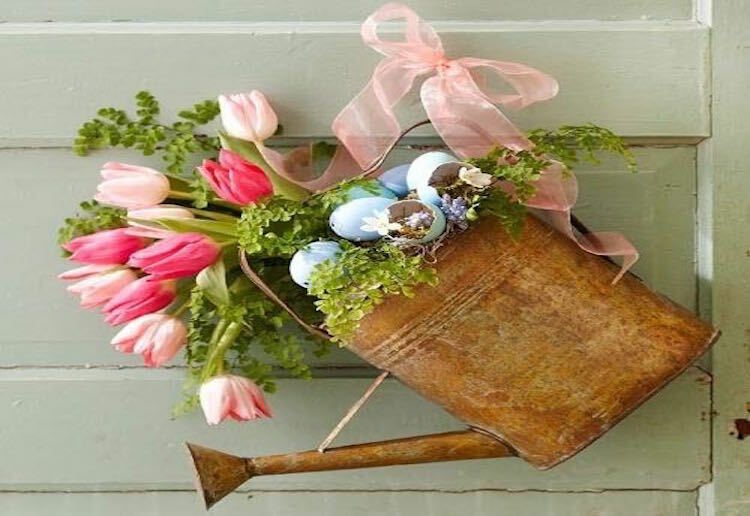 This classic watering can give your garden a rustic and authentic feel. It works well as a small planter or decorative basket. 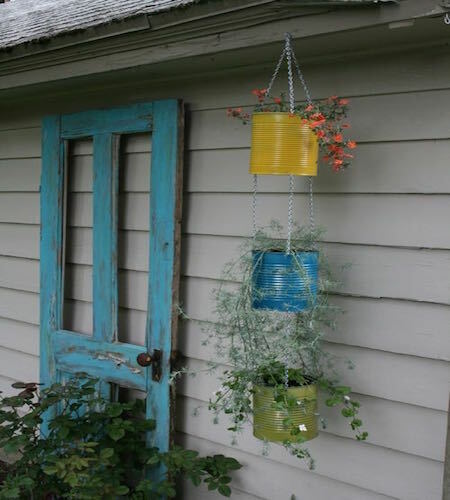 Simply drill holes in the top and bottom of a tin can and run a chain through the holes to create these stacked hanging baskets. 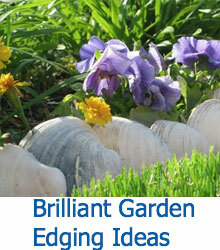 Use them as decorative planters or even as a functional basket for small garden tools and utensils. 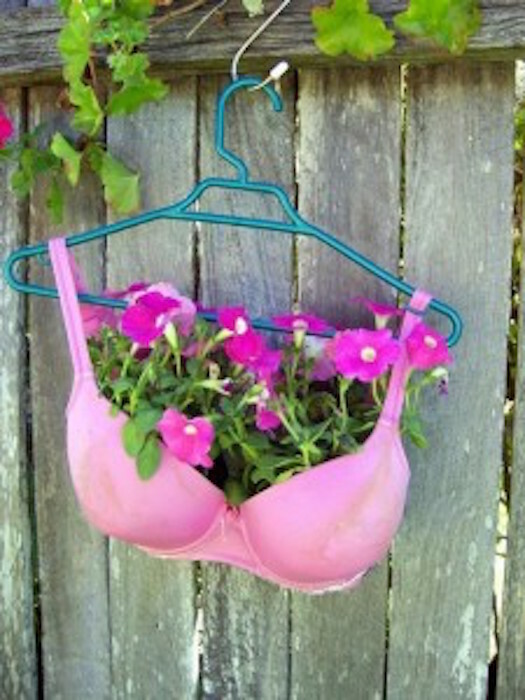 This hanging container is a comical one and a little risque! Maybe not the best idea if you have little ones in your backyard, but this can design can be a great way to get peoples attention and liven up your garden space. 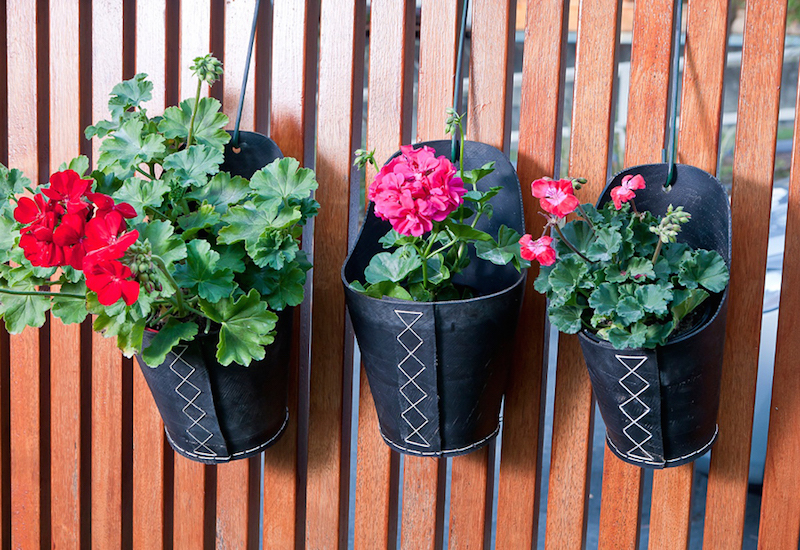 A surprisingly attractive design, these recycled tire inner tubes have been cut and shaped to make the perfect little hanging baskets. These can be hung from any fence or patio as they are small and easy to move. Instead of letting your mothers ancient cooking pots collect dust in the basement, bring them out and get some use out of them! String them up to create these rustic looking hanging baskets. 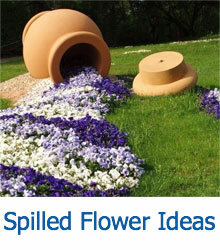 A melted record can form a great bowl and hold any kind of decor that you may want to incorporate into your garden. This is a great way to utilize old records that you don’t need, and a great way to spice up your outdoor space.